Trash To Couture: 80's Dress Sewn Lace Cocktail. 80's Dress Sewn Lace Cocktail. Supplies: 80's dress turned Parisian cocktail. What I loved about this 80's dress was the pretty lace detailing, so I wanted to use that as much as I could for this one. Sleeves were sewn together to create the bodice. The collar line was the bottom of the sleeves. I salvaged all the lace from the front, back bodice, and sleeves. The skirt of the dress was from the front and back of the bodice. I added a beaded belt to finish off the look. Wow, this is truly impressive! You're a huge inspiration to me as I learn to sew. That dress is so HOT!!!! What a show stopper! the upper part really turned out so well! but it does look complicated! This is beautiful... especially the neckline. Great job! wow really!! you're super talented!!! Oh this is really gorgeous! Imagine how you salvaged those delicate laces and turned into a more fabulous dress. I am giving you away my two thumbs up and cheers for this project. this is amazing!! i dont think i would have ever had that kind of outcome! I love the dress you made. Such a clever use of materials. I am truly amazed by how you used the material to make such a elegant dress! Are you kidding me, that is SOOOO gorgeous! You have such a great eye and are very talented. You are amazing!!! love your blog! absolutely stunning! so glad you could salvage all that beautiful lace :) great eye!! you are amazingly talented! Love your designs!! So happy I found your site, your creations are amazing. Fantastic! this dress is stunning! 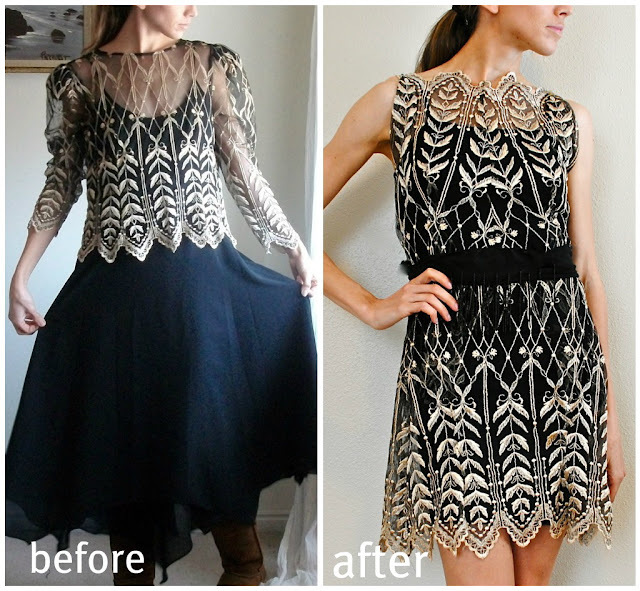 it looks so chic and expensive, great work on this refashion! I can't believe you turned that into that!!!!!!!!! I wish I could do that! Absolutely fabulous!!! Out of this world! The use of the edges both on the upper and lower sides of the dress is the best thing about it. I love all the posts in your blog, lots of great ideas! Thanks for sharing all that! 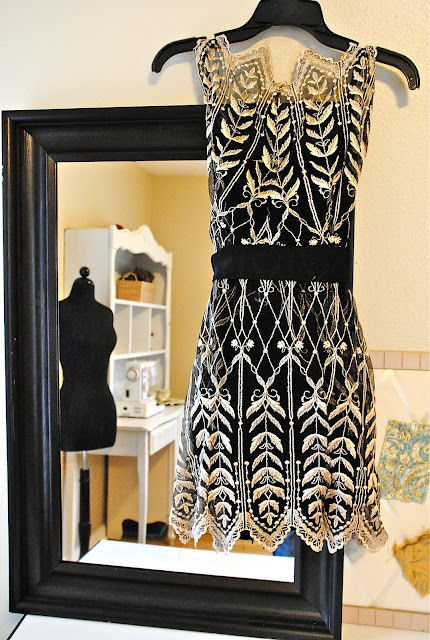 I saw this post AGES ago but can not believe that I found this exact same dress today at a thrift store....my husband thought I was crazy when I said I just have to have it, now I've shown him your blog he gets it! I can't wait to start....have no where to wear it but at least i'll have it and can say I made it. Thank you so much for posting...I would have never thought and now i'm going to have this dress!!!! eek!!! AllI can state is "WOW"!!! Its a beautiful and fabulous dress. You're blessed with such talent and insight. Very interesting, Quilting Embroidery Designs good job and thanks for sharing such a good blog. 1. الحصول على أسعار الأسعار من ثلاث شركات على الأقل. هناك عدة أسباب لذلك يجب القيام بذلك. ليس فقط لمعرفة أي شركة تنظيف هي أفضل الأسعار ولكن أيضا لمعرفة مدى وجود فجوة في أسعار نفس الخدمة. "قد تحصل على ما تدفعه مقابل" قد تكون مبتذلة ولكن هذا لا يجعلها غير صحيحة. في حين أن الاختلافات في الأسعار ليست كبيرة ، فمن الأفضل أن تذهب مع أي أعمال التنظيف المهنية التي تمنحك أقصى ضجة لجهودك. ولكن إذا كان التناقض في الأسعار مختلفًا بشكل كبير ، فيجب أن يخبرك ذلك بشيء ما وأن يعطيك سبباً للشك. أيضا عند السؤال عن أسعار الأسعار ، يوصى بالسؤال عما إذا كانت أسعار الأسعار تشمل كل شيء (المواد واليد العاملة) ومقدار خدمة تنظيف خاصة يمكن إضافتها إلى خدمات التنظيف التي يتم تقديمها. 2. اسأل كم من الوقت كانوا في الأعمال التجارية. 3. أسأل عما إذا كانوا يضمنون عملهم. معظم الشركات تقول إن رضاك ​​مضمون ، ولكن ماذا يعني ذلك؟ هل يعني ذلك أنهم سيقدمون لك استردادًا إذا كنت غير راضٍ؟ من المهم معرفة ذلك قبل توظيف أي شخص للقيام بوظيفة لك (وخاصة تلك التي تضمن الرضا). شركة جيدة سيكون لها عملاء مخلصين ومرتاحين. من المستحسن أن تسأل عن قائمة المراجع حتى تشعر بالراحة مع العلم أنك تتعامل مع شركة تنظيف لديها قاعدة عملاء كبيرة من العملاء الراضين.